"The Mysterons: sworn enemies of Earth. Possessing the ability to recreate an exact likeness of an object or person. But first, they must destroy. Leading the fight, one man fate has made indestructible. 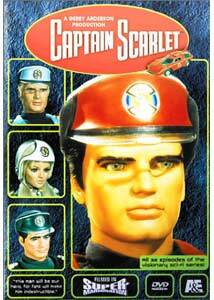 His name: Captain Scarlet." After years of producing sci-fi/adventure shows for television, Gerry and Sylvia Anderson had achieved quite a reputation, especially with a blockbuster like Thunderbirds under their belt. Continuing with their concept of marionette animation as a means to produce a television show, 1967 saw the Andersons create another small screen classic: Captain Scarlet and the Mysterons. Differing somewhat from Stingray, Thunderbirds, and older Anderson material, Captain Scarlet's most obvious evolution is the use of more realistic puppets that are proportioned more like actual people, rather than the "super-deformed" style of some of their previous work, which was necessitated for technical reasons. Another difference is the darker and more mature direction of the plot and storyline which, although still in the realm of children's show, is a bit more frightening and features regular instances of death and destruction which, sadly, are not averted by random acts of heroism. Captain Scarlet is escapist adventure, but it also makes sure to keep the effect of lives being lost in a war against an unseen enemy, in this case, the devious alien supercomputers, the Mysterons. Set in the year 2068, Captain Scarlet tells the story of how Earthmen accidentally awaken a fearsome foe on the planet Mars. During this age, a military organization called Spectrum, led by Col. White, defends the Earth in times of need. Stationed in the atmosphere in their ever-at-the-ready, hovering aircraft carrier Cloudbase, Spectrum basically consists of two halves: the central investigations carried out by "Captains" who all remain anonymous and are named after colors, and the "Angels", an all-female flying division of Spectrum devoted to fighter craft piloting and aerial combat who are named after musical terminology. In the series' first episode (appropriately titled The Mysterons), Spectrum is part of a mission to Mars to investigate the surface. Spectrum agent Captain Black discovers a giant Martian city, much to the surprise of all those involved. The city, long since abandoned, still functions by way of the Mysterons, artificial intelligence machines that have the ability to recreate physical matter when it has been damaged or destroyed. The Mysterons wish to share their knowledge with humans, but when they deploy a radar device to investigate Captain Black's rover, he mistakes it for a hostile threat. Immediately, he uses force, and the city is destroyed, but then instantly rebuilt by the Mysterons. They vow revenge for this cruel attack on their city, and begin by taking control of Captain Black by "re-creating" him for their purposes. The Mysterons are never seen in the show, but their presence is indicated by eerie, hoving, green circles of light. In the process of trying to assassinate the World President, the Mysterons' very first action against Earth, they kill off two spectrum agents, Captain Brown and Captain Scarlet, then recreate them to use to get close to the President. In a quirk of fate, when Spectrum manages to stop this assassination, Captain Scarlet is mysteriously freed of being Mysteron-controlled. Strangely enough, though, he has retained the Mysteron regeneration ability making him virtually unstoppable. Even if he's killed, he'll simply come back to life and fully heal. Spectrum keeps this a secret, and decides to use Scarlet as the ultimate weapon against Mysteron plans. From this moment on, the series adheres to a specific formula: at the beginning of each episode, the Mysterons announce some dastardly plan or vague threat against Earth or Spectrum, then attempt to carry it out while Spectrum tries to guess when and where they will strike. Captain Black is the show's only regular villain, as he is the only regular Mysteron agent. Spanning all 32 episodes, Captain Scarlet: The Complete Series packs all of the intrigue, danger, complex plots, and Mysteron threats into one mammoth, single set. Captain Scarlet's level of technical ability is a few notches above Thunderbirds, which is impressive to see. The models and sets seem to be on a slightly larger scale, and the special effects (by miniatures expert Derek Meddings) are pulled off with surprising technique and violence, thus enforcing the brutality behind what's going on between Earth and the Mysterons. Also, the Andersons must have built many of the props life-size, because most of the close-up shots of people operating computers, turning knobs, and such are performed by real hands. The one drawback to this more realistic approach to the puppets, is that there's no way to make them walk very well without making them look silly. So, as a result, there's very little movement in this show. The filmmakers deserve kudos, though, because this doesn't impact the appeal in any negative way, thanks to the clever soundwork, editing, and overall direction. I can honestly say there isn't a single episode I disliked in this series, and I think an enormous part of that is the 25-minute running time of the installments, which provides a perfect way to compact the episodes into something that moves faster and has more dynamic character interaction than a full hour, which can often be too long to sustain active interest. Thanks to the pulp sci-fi element of Captain Scarlet, the stories adhere to a very firm "fight the enemy" style, yet manage to avoid a lot of clichés. As Gerry Anderson puts it, the show is basically like a war series, only the war is on a whole different level than the usual battlefields and campaigns. The writing is creative here and there, and the number of different settings is quite refreshing. While most stories are about the Mysterons making attacks on fairly obvious targets, there's a few crafty episodes. For example, in The Heart of New York, a group of enterprising thieves decide to pretend to be Mysterons and threaten New York just so everyone will clear out and they'll be able to rob a bank with no fear of cops. Of course, when the real Mysterons get involved, things get interesting. Or Renegade Rocket, in which a satellite radio station that Spectrum personnel love listening to, suddenly turns into a weapon targeting Cloudbase itself. Then there's other plots where even Spectrum personnel are suspected of being Mysterons. You're not sure who to trust in the series, which places a layer of tension over the whole show. It bears mentioning that my praise for the show comes from having only just been exposed to it. Unlike British children of the 1960s and '70s, and other lucky folk around the world, I honestly never saw the show as a child. While I enjoyed Thunderbirds as a youngster, oddly enough, I don't recall Captain Scarlet getting airtime in my neck of the woods. Funny how one generation's cultural standard (I'm only just now getting all sorts of in-jokes about Scarlet I've caught over the years from folks "across the pond") is someone else's complete discovery. In the end, though, I think Scarlet is some of the best work to come from Anderson's TV Century 21 projects. Of course, eventually he moved on to live actors with cult work like UFO (also receiving the DVD restoration treatment from Carlton), but there's still a strong storytelling element here that works, even today. It might be a little campy and a bit dated, but the creativity and massive, hard work shows in every moment on film. Image Transfer Review: Although the age of the show means there's quite a bit of grain, the transfer still manages a very colorful, bright, and rich image. This is obviously a good thing, what with the wild design schemes and visuals of the show. The presentation is pretty much free of major artifacts or deviations, but the grain aspect does bring out some heavy compression artifacts whenever there's dark, meshed textures, especially smoke or fog. This is attributable to the age of the program, though, and hardly effects the overall impression. It's a very clean representation of a show that, in all likelihood, probably didn't look this good even when originally aired. Extras Review: Before delving into the extras, I should mention some minor technical problems with the set, which may or may not be effecting all production versions. On each of the 4 discs, the first episode must be accessed manually (either on track 1 or track 8), as going into the menu for that episode crashed my DVD player for some odd reason. Regardless, it's important to mention that the episodes reside on tracks 1-8, so if you do have menu troubles, simply use manual access to get around that. The one feature in the set that should please everyone is the commentary of Gerry Anderson on two of the 32 episodes: The Mysterons and Attack On Cloudbase. The commentaries are fairly dense and packed with information about the show, as well as the evolution of the whole concept of Captain Scarlet. In the hour of time Gerry Anderson has, he makes very good use of it, offering very entertaining and enlightening insights into the show. He also has a good sense of humor and balances technical information without being too dry about it. Each of the four discs has photo galleries of either stills from the show, stills from the on-set experience, or both. Interestingly, many of the stills do not appear in the episodes they are attributed to, but are more composed and staged, probably for episode guides of the time or even other material (like, say, Viewmaster slides). One will also find fictional biographies of the characters, a quick introduction to the world of Scarlet, reproductions of Spectrum ID badges, and a guide to the Spectrum Pursuit Vehicles. There is a DVD-ROM feature supposedly containing additional technical read-outs of the Spectrum vehicles, but I was unable to access this (lack of DVD-ROM drive). The overall presentation is top notch, starting with the use of a 4-pack Alpha case that nicely does away with the cumbersome boxed, multiple-Amaray cases of most television sets. The artwork on the cover and in the disc menus is nicely suited to the show, including all the same wild color schemes. One humorous touch is using the same "floating circle" lights that represent the Mysterons as the chapter selection icon. The case itself is clear, allowing you to see the reverse side of the cover, which contains brief episode synopsis and tells you which disc has which extras. Carlton is probably one of the most overlooked studios when it comes to DVD productions of European television, but so far, their reputation is quite well earned and Captain Scarlet is just another example of their care for these bits of cultural history. Fans of the show will have already made this a must-buy, but if you're still on the fence, I can heartily recommend the series as an entertaining, adventurous bit of sci-fi with a strangely dark tone to it. Being able to buy the whole set in one go is also a nice money saver, yet not a corner was cut to make this wonderful set. Gerry Anderson claims the series will return soon, in a new computer-animated version. Follow the development on his website: TV Century 21.